Application Blocker Pro is both an internet parental control software and a monitoring solution that protect your child while surfing the internet. The application will block websites that contain inappropriate content or images, application running like messenger application, or system folder like Task Manager. The blocked user can receive personalize notification that his activity was blocked or there can be no notification showed up. 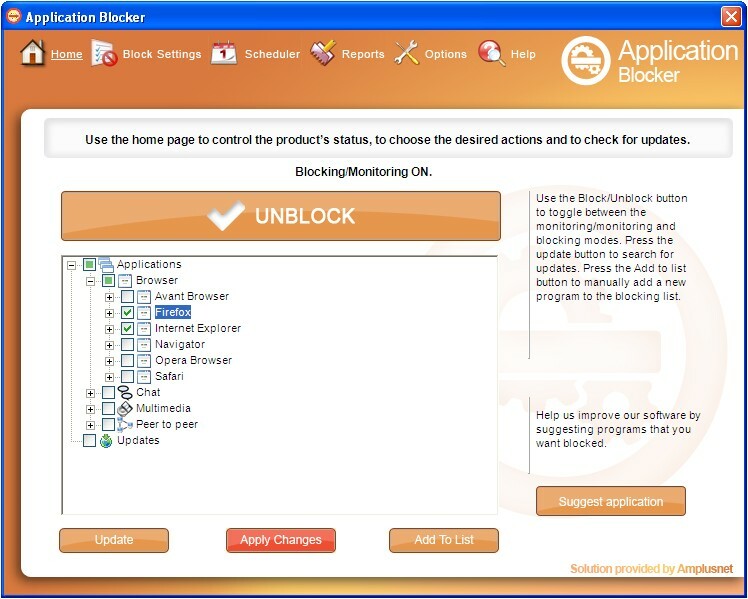 Application Blocker Pro is an internet parental control & a monitoring solution. Application Blocker Pro parental software is an application specially created for parents concerned about their children's computer activities including the Internet usage. In this ever busy society, parents need a tool that should keep an eye on their children computer while they cannot be around (while they are working, housekeeping and many others). But this software is not addressing only to busy parents but also for those who need to certify that their children are having a safe web browsing and they are making homework instead of chatting. The parental monitoring and blocking software assures you that the time your children spend on the computer is not wasted time. Qweas is providing links to Application Blocker Pro 1.3 2012 as a courtesy, and makes no representations regarding Application Blocker Pro or any other applications or any information related thereto. Any questions, complaints or claims regarding this application Application Blocker Pro 1.3 2012 must be directed to the appropriate software vendor. You may click the publisher link of Application Blocker Pro on the top of this page to get more details about the vendor.